Cannabis concentrates provide numerous benefits to medical marijuana patients. Cannabis concentrates are growing in popularity because they offer all the medical benefits of cannabis with none of the unusable components of cannabis flowers. "Concentrates have taken over the cannabis community," Rhory Gould, founder of ArborSide Compassion, a medical marijuana dispensary in Ann Arbor, Michigan, told High Times. "Concentrated cannabis can generate up to 40 percent of our sales in the form of wax, oil, hashish, kief, e-pens and edibles made with concentrates." Cannabis extraction is done in a number of ways. Solvent-based extractions are just a few of the many, but they provide numerous benefits. Three of the most common solvents are butane, ethanol and supercritical CO2. Butane and other hydrocarbons, like hexane and propane, can make fast work of dissolving plant compounds like terpenes and cannabinoids. Butane hash oil is known for its high potency; it's common for this product to have a THC content of 80 to 90 percent, Medical Jane explained. This makes it ideal for medical marijuana patients, who are seeking out strong medicinal properties to treat their conditions. 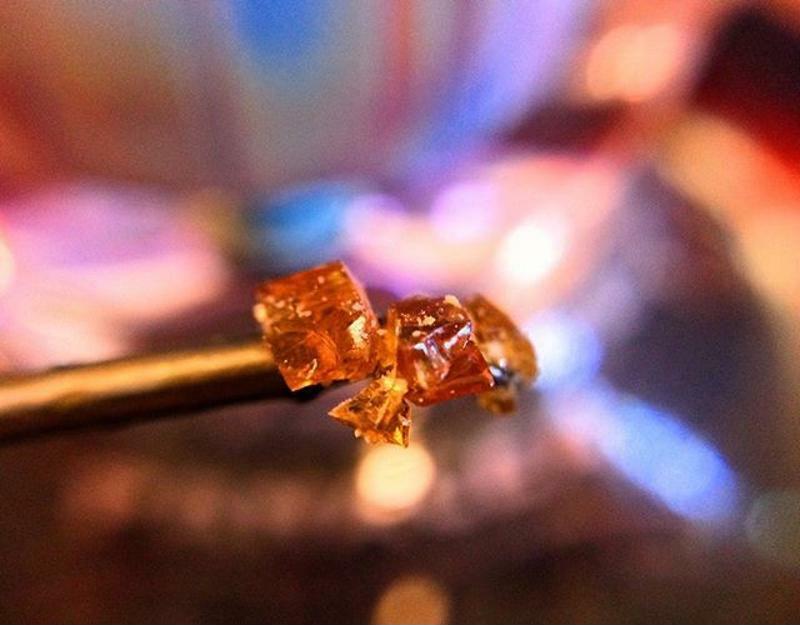 Butane hash oil is a highly potent cannabis concentrate. Outside of the cannabis industry, hydrocarbon extraction is used to make oils such as those derived from corn, canola seeds or olives, Chowhound reported. It's also commonly used to create essential oils for fragrances and flavorings, High Times noted. As such, it's a well-known method to capture desirable organic compounds and leave behind what's not needed, like plant stocks and leaves. The process to make BHO begins with a tube of plant matter and a vessel containing the butane or other hydrocarbon. The solvent is then pumped over the flowers, drawing out compounds like terpenes, which contribute aroma and flavor, and cannabinoids such as THC, CBD, CBA and others. Some people mix propane with their butane to increase polarity, which can contribute to a more thorough extraction. The infused butane then flows into a collection vessel to await further processing. At this point, the solution isn't safe to consume because it's still filled with hydrocarbons, and may contain pesticides or other substances that were used in the growing process. The oil needs to be heated to remove these toxins. This process must be done carefully; too much heat can degrade the final product, reducing its quality and effectiveness. As the butane is boiled off, the golden, sticky substance left behind is the BHO. It can result in a number of different consistencies, which are accordingly named ("shatter" for glass-like extract that's easily broken into jagged pieces; "crumble" for drier substances; "sap" for a more gooey, honey-like concentrate). Though they may look distinct on the store shelves, the primary differentiator between these products is the temperature at which they are made, Medical Jane explained. Ethanol extractions are similar to BHO in that they involve pouring or dripping the solvent over the marijuana buds to extract terpenes and cannabinoids, then removing the solvent so a pure substance is left behind. Ethanol is one of the oldest solvents used for creating cannabis concentrates, Herb reported. One benefit of ethanol is the speed at which it can dissolve cannabis compounds. One major difference between butane and ethanol extractions is the polarity of the solvent. Where butane is not very polar, ethanol is highly polar. This results in a solution that contains more than just the cannabinoids and terpenes. Chlorophyll, tannins and other pigments also make their way into the product and should be removed before consumption, Leafly explained. Activated carbon filters are popular devices to remove these unwanted compounds. Activated carbon is commonly used in water filters and to clean up chemical spills, according to Slate. That's because the porous and highly absorbent nature of activated carbon allows it to quickly and easily soak up contaminants. For this same reason, it's ideal for removing compounds like chlorophyll from cannabis concentrate. As with butane, ethanol should also be heated to evaporate the solvent out of the solution, Herb noted. Supercritical CO2 is rising in popularity in the cannabis industry because it's considered a more natural solvent than hexanes and alcohols. This substance doesn't leave behind potentially harmful residues in the final product, Medical Jane reported. "Since supercritical CO2 is very cold, it preserves the natural qualities of the cannabis being concentrated." Supercritical fluids are gases that are highly pressurized until they change to a liquid state. Once the CO2 is pressurized, it's pumped over the plant matter, similar to butane and ethanol extractions. Supercritical CO2 is naturally very cold, which provides several benefits to the extraction process. Heat affects the quality of concentrates; since this type of solvent is very cold, it preserves the natural qualities of the cannabis being concentrated, including flavor, aroma and the medicinal properties users experience with it. Another primary benefit to the low temperature of supercritical CO2 is how easy it is to remove the solvent. Rather than heating and evaporating the solution until the solvent escapes, supercritical CO2 reverts back to its gaseous form quickly; its boiling point is -56 degrees Fahrenheit, according to High Times. One effect of the cold temperatures used in making supercritical CO2 concentrates is a thin consistency compared to waxes made with ethanol and butane. For this reason, supercritical CO2 is most commonly used to fill vape pen cartridges. No matter what extraction method you choose, selecting quality equipment can make a big difference in your operation. When creating BHO and ethanol extractions, the explosive properties of the solvents can pose a safety risk if equipment isn't air-tight. Vessels for supercritical CO2 concentration production must also be airtight to maintain the highly pressurized environment the solvent requires. Further, keeping the entire extraction process completely sealed prevents contaminants from the air to enter the final product, thus contributing to a pure concentrate. One thing all three of these solvents have in common is their ability to be reclaimed and reused. When the butane, ethanol, CO2 or other substance evaporates away from the concentrate, it can be funneled back into a collection vessel and reused for another batch. However, to do this, the operation needs to have equipment to facilitate the reclamation. Enerquip's shell and tube heat exchangers used for cannabis extraction are designed to keep the process isolated from the surrounding environment. They can also direct evaporating solvents to a collection vessel so they can be reused. Enerquip's engineers have experience creating pharmaceutical grade equipment, ensuring a clean, safe product. To learn more about using stainless steel shell and tube heat exchangers in your cannabis concentrate production operation, request a quote online and a heat exchanger expert will reach out to you.